The city of San Francisco filed suit Tuesday against President Trump and his administration, charging that Trump's order to strip funding from sanctuary cities amounts to an invasion of the city's sovereignty, a violation of the 10th Amendment. City Attorney Dennis Herrera and Mayor Ed Lee announced the lawsuit (embedded below) at City Hall, arguing that previous court decisions over states' rights issues prevent the federal government from enacting policy like last week's executive order. A spokesman for the White House did not immediately respond to a request for comment. Trump's executive order directs the U.S. attorney general and secretary of the Department of Homeland Security to take federal grants away from jurisdictions that refuse to comply with a U.S. law that requires local governments to communicate with the federal government about undocumented immigrants. "Sanctuary jurisdictions across the United States willfully violate federal law in an attempt to shield aliens from removal from the United States," the order stated. "Tens of thousands of removable aliens have been released into communities across the country, solely because their home countries refuse to accept their repatriation. Many of these aliens are criminals who have served time in our federal, state, and local jails. The presence of such individuals in the United States, and the practices of foreign nations that refuse the repatriation of their nationals, are contrary to the national interest." But the lawsuit states that San Francisco's sanctuary laws don't prevent the city from communicating with federal officials -- and Herrera said city officials do that regularly. 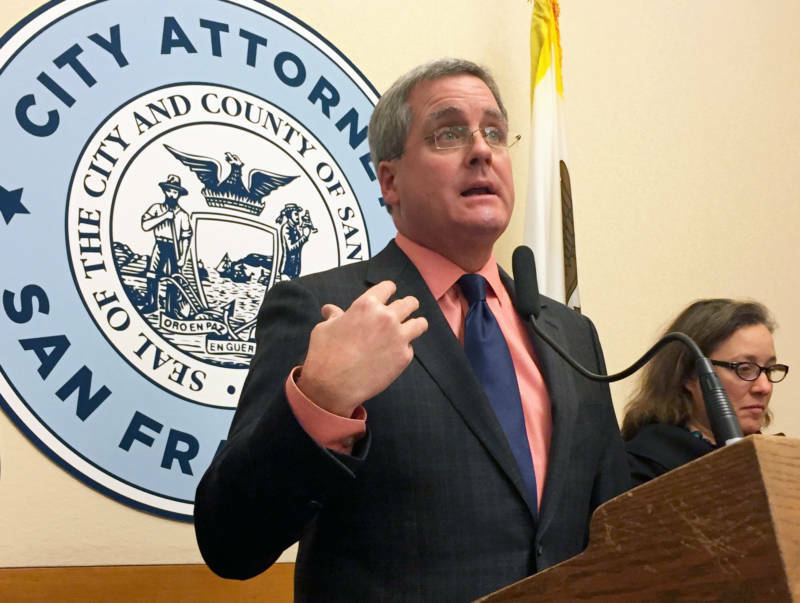 The city attorney wants a court to rule that San Francisco's sanctuary policies and ordinances comply with that federal code, or to decide that the relevant federal law is unconstitutional. “President Trump's executive order tries to turn city and state employees into federal immigration officers. That is unconstitutional," Herrera said. "No president can commandeer the local police force and turn it into the deportation arm of the federal government." Herrera argued that the order undermines local communities by "sowing distrust of law enforcement," and that far from making cities safer -- as Trump and supporters of the order claim -- it will make them less safe. He cited a report, released last week by a pro-immigration group, finding that there's less crime in sanctuary jurisdictions. "Sanctuary policies encourage undocumented immigrants to report crimes so that cities can investigate and prosecute. These policies get violent criminals off the street who might otherwise not have been reported," he said. 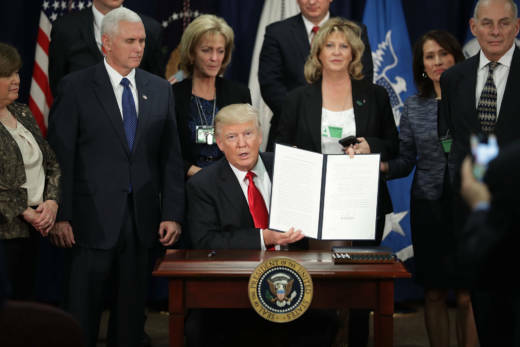 "Many people think that sanctuary city policies protect criminals, but that is wrong. If the federal government has a criminal warrant, we honor that." Herrera said the city has been gearing up for a legal fight since Trump's election, given his campaign promises to target sanctuary cities. And both he and Mayor Lee said they would welcome the participation of other sanctuary cities and the state of California in the lawsuit. “We are ready to fight to keep our city safe," Lee said. "As a city we will fight back, and today we fight back." Lee and Herrera downplayed the possibility that the suit would make San Francisco even more of a target for the Trump administration and Republicans in Congress. "It's no secret San Francisco has been a target, as it were, from well before the filing of this lawsuit today, and we owe it to our residents to make sure we are protecting their interests, protecting taxpayer dollars," Herrera said. "We are going to use every tool at our disposal to make sure that the rule of law is followed, our residents are protected and they know they have an entity here that will fight on their behalf." Asked if he has a message for the new president, Herrera didn't mince words. “Obey the rule of law. Abide by the Constitution. We are a nation of laws, not of men, right? And there are processes and there are legal structures there that give a level of predictability that we all have to live by," Herrera said. "You're not emperor who rules by fiat. We all have to abide by the rule of law, and we are going to make that clear."